With an audio engineering background, Alex Celler has established himself as one of the premier players with his dancefloor shakers. 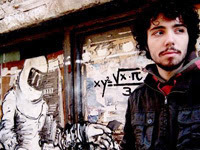 With its catchy hook and stylish lustre, ‘La Palma’ (Arearemote) was one of RA’s most charted tracks and undoubtedly marked a turning point in Alex’s career. Follow-up releases ‘Trapped in Dub’ (Tuning Spork) and ‘North London Cutz’ (Cinematic) have helped rapidly cement an energetic and intense tech house sound full of swing, tribal rhythms & deep basslines. Don't miss out this rare Greek-UK appearance, this is not something we often see. 12.03 Friday See you @ Luxy!